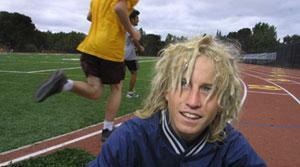 Menlo Atherton cross country runner Jeremy Mineau ran 9:15 in the 3200 as a sophomore last spring. By all accounts, Jeremy Mineau is just another student. He hangs out with his teammates on the Menlo-Atherton cross-country team, jokes with them and takes part in their pranks. He's sociable, friendly and seems no different from the others. But he is different. Mineau is fast. Really fast. His coaches say he is the best male runner ever to be in their program. His teammates marvel at how swiftly he moves farther and farther away from them on the course. Even the area's top runners can't keep up with him. As a sophomore during last spring's track season, he ran the 3,200 meters in 9 minutes, 15.92 seconds, and this fall, he has posted lopsided wins at invitationals in Clovis and Monterey. Mineau finished 14th in the Central Coast Section his freshman year, and finished sixth in the 3,200 that year, running 9:27.98. The disparity in ability between him and those around him has forced Mineau to separate himself at times from his teammates. Mineau's talent requires special care, and Coach Eric Wilmurt has been more than willing to accommodate. Last Wednesday, Menlo-Atherton had a league meet, but Mineau took the race off to rest for last weekend's Mount SAC Invitational in Southern California -- an event at which he would be the Bears' sole representative. ``It was a little weird,'' Mineau said of watching, instead of running during the league meet, where his team finished second to Aragon. The intention was to give Mineau an opportunity to be around others like him, elite runners with seemingly infinite lung capacities and greater tactical sophistication. In 2001, Mineau didn't compete against runners like that until late in the season, and he thinks that was one reason he placed a disappointing 42nd in the state meet. And at Mount SAC, Mineau got what he asked for, finishing 11th at 15:15 on one of the country's most rugged courses. It was Mineau's second race this year against a highly competitive field, the first one being the Stanford Invitational, where he placed fourth. Mineau thinks the experience will help him earn a top-five finish at the Division II state race in November and give him a good showing at the Footlocker West Regional. Wilmurt laughs at the memory of Mineau coming out for his team as a freshman just to get in shape for soccer. It was immediately obvious, Wilmurt said, that Mineau was different. And the fun, Wilmurt expects, will continue. Contact Dylan Hernandez at dhernandez@sjmercury.com or (408) 920-5473.